I was pleased with myself; I had a plan to get the much-needed long runs in. On Brighton Marathon weekend, I was to go to the Marathon Medical Conference this afternoon, helping with some of the administration, exhibiting on behalf of Brighton and Sussex NHS Library and Knowledge Service - I provide information support to the Marathon Research Group, and enjoying and learning from the presentations, Then, on marathon day, I was to be on duty helping with logging injured runners as they present to the medical tent at the finish. I had cunningly booked the Friday before and the Monday after as leave, and the plan was to fit a long run in on one of those days. 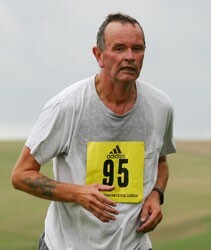 I’d run with a group of Striders on Wednesday, on a lovely if chilly evening. A Friday run didn’t happen, but that didn’t matter. Saturday’s plan was to run to Seaford Beach parkrun, do the parkrun, and then run back, which makes a nice seven mile total, and then on Monday I’d go for a ten miler. I volunteered for one of those coveted parkrun roles which allows one to volunteer and run, the pre-course check. All this required was that I leave home, and run along the seafront the way I would anyway, looking for any hazards that the event team should know about. At Seaford, this usually means shingle washed up onto the course, but it was clear, apart from a van collecting rubbish from the bins along the sea-front. I reported this to the event director, and was joined on the start line by Ash, Duncan, and the lovely Mabel, Ash’s cockapoo. Off we went, and Duncan and I ran together. Ash, with his companion, tailed us on the way out, though on the way back Mabel increased the pace, and overtook us. We chatted merrily, and were discussing my Australian niece Erika, and her work on the forest red-tailed black-cockatoo (Calyptorhynchus banksii naso), with about 400 metres to go to the finish. Here I fell. There seemed to be a lot of blood. I hit my head, knee and shoulder. Various runners gathered round to help, and raised me to my feet. I walked the remaining distance to the finish, collected my token, and then received first-aid at the hands of the Run Director herself and an A&E doctor who happened to be running that morning, Ash and Duncan fed me with coffee, sausage sandwiches, and drove me to Lewes to the Minor Injuries Unit there, where a very professional nurse glued the cut on my head and bandaged my leg. I’m very grateful to everyone involved.